Branding Value Now Green & Environment,Sustainability A Greener Concert. – A long list of concerts spanning the globe. Check. – Countless plane tickets. Check. – multiple Semi trucks filled with equipment. Check. – Large Lighting and Sound arrays that consume thousands of Amps of power. Check. – thousands of rabid fans each with their own vehicles driving up to several hours to the venue. Check. Sounds like a recipe for eco-disaster, right?? Or perhaps its an opportunity to challenge the conventional concert and innovate.? British rockers, Radiohead, did just that. Radiohead has a long history of doing things differently not only in terms of their music (which constantly changes and evolves) but also in terms of how that music is distributed and consumed.? With their latest release, in rainbows, they decided to surprise everyone and release their new album exclusively online….for a pay-what-you-will digital download!? Front-man Thom yorke said he wanted to see what the value of music was to the average consumer.? 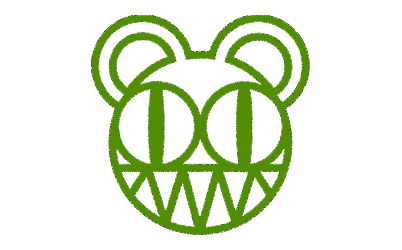 Radiohead’s bold move struck a chord with other artists, resulting in similar “internet-only” distribution from acts such as Nine Inch Nails.? Now Radiohead is taking all that innovation and applying it to the greening of their 2008 world tour. Offsetting the massive carbon emissions resulting from a major tour is no easy task, but the band along with project manager Richard young were determined to do their darnedest to reduce the environmental impact as much as possible. The center-piece of their innovations is the brand new LED lighting system.? LED lighting which has been around for quite some, is significantly more efficient than traditional incandescent and fluorescent lights (17 lm per watt for incandescent and 50 lm per watt for fluorescent lights vs over 100 lm per watt for LED’s). However since nobody had ever attempted building an LED lighting system of such magnitude, Richard young had to collaborate with stage lighting companies Element Labs and I Pix to develop a custom lighting array that consumed a fraction of the power compared to conventional stage lighting.? The concept involves several innovations. For instance, traditional stage lighting is powered by the cities’ electrical power grid, as such the power is always on which wastes a large amount of power when idling.? To combat this problem, the lighting system is run off of an off site battery which adjusts according to the present power consumption needs (charging the batter when power consumption is low). In a nutshell its a system that works similar to a hybrid vehicle.? ? What does this translate to in terms of raw numbers? A traditional lighting setup requires approximately 1800 amps of power, with the new LED lighting system, The power requirement is reduced to 420 amps (including video).? As impressive as these numbers are, there is an even larger gap in power consumption when one takes in to account that a traditional lighting system uses a subtractive lighting method (placing colored filters in front of a white light source to achieve the desired color) which translates into 100% consumption for only 1/3 of the output. LED lights differ in that they are separated into red, green, and blue colors, so using a single color only consumes 1/3 of the power. When you put it all together the LED system uses about 75% less power than the conventional alternative.? Of course the best part of this lighting setup is that it looks amazing. Of course the lighting isn’t the only source of carbon emmissions, the band also targeted other areas of concern such as transportation. The primary method used were buses which are a far more eco-friendly alternative to air travel. For hauling their equipment, each truck was fitted APU’s (auxilary power units) that provide the trucks with power, eliminating the need for idling.? Of course, the band and crew aren’t the only ones traveling, the thousands of fans each travelling in their own vehicles was a huge problem.? The band decided that creating incentives and alternatives to personal transport were the key.? At their show at the Hollywood bowl, ticket to ride provided incentives such as admission to the local zoo, museums, etc. for using their bus transfers to the show. Radiohead is proving that, with a little bit of creativity and work you can provide solutions for such eco-unfriendly events as concerts.? Lets hope more artists follow their lead instead of settling.